Using coupons is a great way to save money and keep within your budget. However, most people don’t use coupons because they think that it takes too much time. I would have to agree with this. Using coupons does take a lot of time, but it doesn’t have to. There are ways to save yourself a lot of time and money by using coupons. 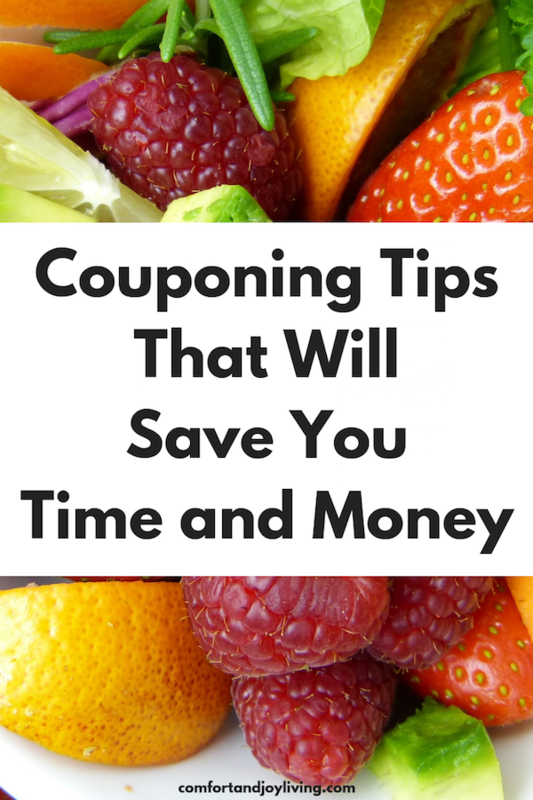 Below you will find five time-saving couponing tips that will have you saving both money and time! Cutting your coupons takes up a lot of time. Cutting coupons is the reason that some people stop couponing altogether. Thankfully, there is a way around cutting your coupons that will save you a lot of time. When you are visiting coupon match-up sites, you will see abbreviations like RP, SS or P&G. These stand for Red Plum, Smart Source and Proctor and Gamble. If you want to use the no clip method, you can simply pick up your newspaper every Sunday and take out the coupon inserts. You will want to write the date on the cover of the coupon insert along with the abbreviation for the insert. For instance, Red Plum might look something like 9/14/18 RP. Once you have all of the inserts from the weekend newspaper, you can organize them in a file holder. Having your coupons organized in this way will allow you to find coupons when looking at coupon match-up sites. If the no clip method doesn’t work for you, that’s okay. You can cut all your coupons at once and put them into a binder if you would like. Cutting each individual coupon out of an insert an easily take hours. You can save a lot of time by cutting all of them at once. Line up all matching coupon pages, staple them together and carefully cut them out. This process works great if you want to cut your coupons and save yourself a lot of time. Once you have all your coupons cut, you can organize them in a binder or any other system that you’re using. Use your smartphone. You can use the Saving Star app to load offers directly to your store’s rewards card. Many grocery stores allow you to load their eCoupons to your rewards card from your phone. Search the Ibotta phone app and the Checkout 51 app to find cashback offers on the items on your grocery list. In order to coupon effectively, you’ll need to come up with some sort of organization system. It’s almost impossible to coupon if you’re not organized. You can sue the no clip method listed above or you can use any other system that works well for you. The key here is finding a system that works for you and sticking to it. The more organized you are, the easier couponing will be for you. Sunday: Pick up the newspaper and cut or file your coupon inserts. Monday: Look up the weekly sales and make a grocery list of what you need to buy. Once you have your list together, putt the coupons that you’ll need. You can find most of the grocery sales in your area on the Favado app. Tuesday: Go shopping. This allows you to take advantage of the sales that just began on Sunday while also getting all the deals that expire on Tuesday (some of the store sales in my area run from Wednesday to Tuesday and some run Sunday to Saturday). Before going shopping make sure that you have a list. A detailed list. Some people like to make this list in Excel where others like using pen and paper. Either way is fine. You will want to list all the stores that you need to visit, what you need to buy at each store any coupons that you have. I make my list by the order of my grocery store layout. If I am going to visit a few stores, I’ll make a separate list for each store. I paper clip each coupon that I plan to use to the grocery list. I also bring my coupon book in case I find a great deal that I want to match with a coupon. I make a note next to the item if I have an eCoupon that I need to redeem, so that I don’t forget to either redeem it at the cash register or submit it once you have completed the purchase. You will also want to have your coupons organized in a way that will be easy for you to see if you need to pull one out of your coupon file and hand them over to the cashier during check out. What time-saving couponing tips do you have?